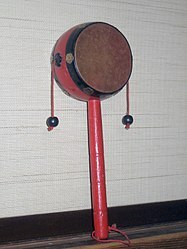 The den-den daiko (でんでん太鼓) is a Japanese pellet drum made popular in the film The Karate Kid Part II. It has two heads and is suspended on a rod, with beads or pellets hanging on threads on either sides of the body of the drum. The drum sounds when it is turned on its axis from side to side, causing the beads to strike the heads of the drum. ^ Dizon, David (April 20, 2018). "Review: Astig! Drum Tao plays you like a beat ballet". ABS-CBN News and Current Affairs. This page was last edited on 22 January 2019, at 16:13 (UTC).